There are so many ways to use Blue Elderberries it's hard to know where to begin. Here are a few of our favorite elderberry recipes to get you started. Grease an 8” x 8” or 9” x 9” baking pan. Spread 4 cups cleaned, fresh elderberries in the bottom of the pan. Sprinkle with ¼ cup sugar. In a small saucepan melt 1/3 cup butter. Turn off the heat. Stir in 1 cup sugar and ¾ cup flour. Mix until crumbly. Spread mixture on top of elderberries. Bake 30 to 35 minutes at 425º F.
Preheat oven to 375º. Grease a 9 inch cake pan. Pour the melted butter into the pan. Sprinkle brown sugar evenly over the butter. Scatter the berries over the sugar. Place butter, oil and sugar in a large mixing bowl; beat at medium speed until well-blended. Beat in egg and extracts. Sift together flour, baking powder, baking soda and salt. Add flour mixture and buttermilk alternately to the butter mixture, beating at low speed until just combined. Pour batter on top of the berries. Bake 30 to 35 minutes, until top is golden brown and sides are bubbly. Remove from oven, cool 5 minutes, and invert onto a serving plate. Serves 8. Note: you can substitute dried elderberries for fresh in baked goods if you first reconstitute them. 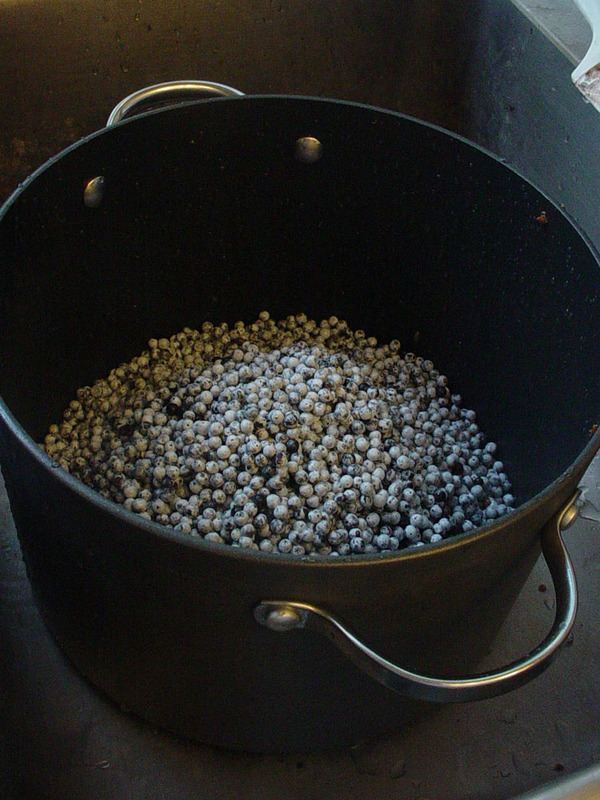 Just covering the berries with boiling water and let them soak for an hour before using. You can then use them in cakes, muffins, fruit cakes, etc. The dried berries will swell by 50%, so you need to multiply the amount called for in the recipe by 0.67 to get the amount of dried elderberries needed. 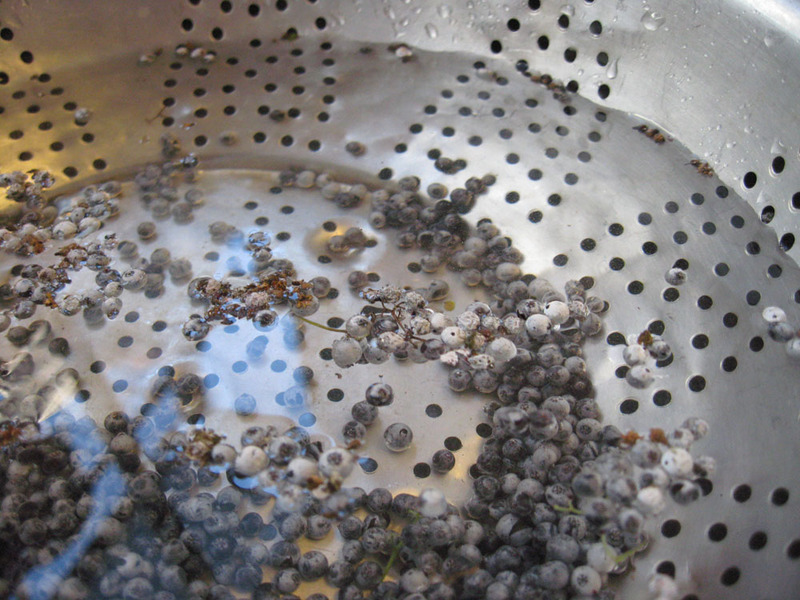 Place 1-3 tsp dried elderberries in a tea strainer or tea bag. Cover with 1 cup boiling water. Let steep 5-10 minutes. Remove berries. Sweeten if desired. 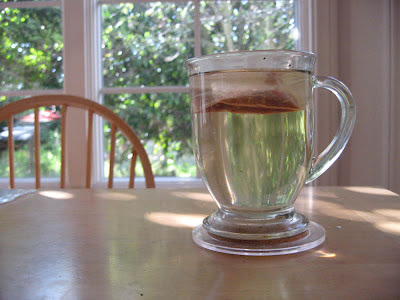 Enjoy a nice, healthy cup of tea. For a more intense flavor, you can pulverize dried elderberries in a coffee or spice grinder. You’ll only need about 1 tsp pulverized elderberry per cup of tea. 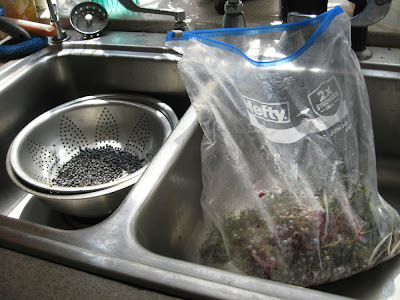 Wash & clean the elderberries (about 6 qt. or 3 lb. fully ripe elderberries). Crush berries & place in a large heavy pot. Add water to just cover the berries and bring to a simmer. Simmer about 30 minutes or until juice is a dark color. Strain hot pulp mixture through a jelly bag to obtain prepared juice. Bring to full rolling boil, stirring often. Add the sugar and stir in quickly. Bring again to full rolling boil. Boil 1 ½ minutes. Fill prepared canning jars. Process in boiling water bath for 5 minutes (if processing at 1,001 feet to 3,000 feet, add 5 minutes to processing time; if processing at higher elevations, see instructions for processing at altitude in the instructions included with the pectin or on-line). Makes about five to six 8-oz jars. Enjoy this old-time favorite! Measure exactly 3 cups juice into a heavy 6- or 8-qt. saucepot. Stir in lemon juice. Stir sugar into juice in saucepot. Add butter to reduce foaming. Bring mixture to full rolling boil (a boil that doesn't stop bubbling when stirred) on high heat, stirring constantly. Stir in pectin. Return to full rolling boil and boil exactly 1 min., stirring constantly. Remove from heat. Skim off any foam with metal spoon. Ladle hot jelly quickly into prepared jars, filling to within 1/8 inch of tops. Process in a boiling water bath for 5 minutes (adjust time for high altitude if processing at over 1000 ft elevation). Makes about 7 1-cup jars. Elderberries don’t have much pectin (the natural substance that causes jams & jellies to ‘jell’). If you want to make an Elderberry Jelly with no added commercial pectin, you’ll need to combine the elderberries with a fruit that has high levels of natural pectin like tart (baking) apples or crabapples. First prepare an Elderberry/apple juice. You’ll need about 6 quarts (3 lb) ripe elderberries and 4 medium-size tart cooking apples (Granny Smith; Gravenstein; Rome). Mash the berries and quarter/chop the apples. Proceed as discussed above under ‘Preparing Elderberry Juice’ to prepare the Elderberry/Apple juice. Place juice, sugar and lemon juice in a heavy 6- or 8 quart saucepan. Bring mixture to a full rolling boil and boil for 1 minute. Lower the heat and continue to cook, stirring regularly, until the mixture reaches 220°F. on a candy/jelly thermometer (NOTE: For each 1000 feet of altitude above sea level, subtract 2 degrees F. For instance, at 1,000 feet of altitude, the jelly is done at 218°F; at 2,000 feet, 216°F, etc.). If you don’t have a candy thermometer, there are other ways to test whether your jelly is done (see http://nchfp.uga.edu/how/can_07/jelly_point.html). Remove from heat. Fill prepared canning jars. Process in a boiling water bath for 5 minutes (adjust time for high altitude if processing at over 1000 ft elevation). Prepare as for Elderberry Jelly but use ½ the amount of pectin called for in the recipe. Process as for jelly – or store short term in the refrigerator. Place sugar, syrup and spices (optional) in a heavy saucepan. Simmer over medium heat until mixture boils. Continue to simmer 5 additional minutes. Remove from heat. May be processed with boiling water bath (as for jelly) or cooled and stored in a jar in the refrigerator. You can make this syrup in any amount needed – just use 1 cup sugar per cup of juice. This syrup makes a refreshing summer drink when used to flavor sparkling water or 7-Up. You can also use it in punch, lemonade or over ice cream. 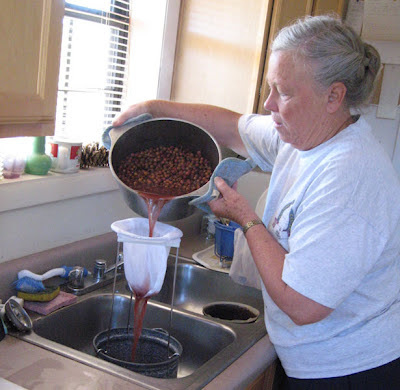 If you have an elderberry recipe you'd like to share, please feel free to post it as a comment, below. When it comes to summer flavors, Blue Elderberries are hard to beat. These tasty berries can be used in baked goods, processed for juice/jelly/syrup or dried/frozen for future use. Right now is peak Elderberry season, so we’d like to share some tricks about picking, cleaning and processing these little gems. 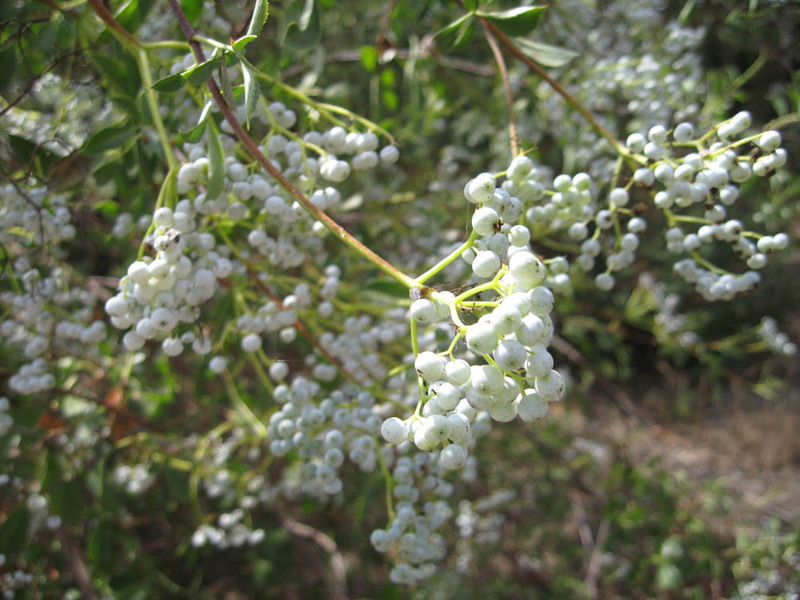 Blue Elderberries are ripe when they turn a light blue color (see above). 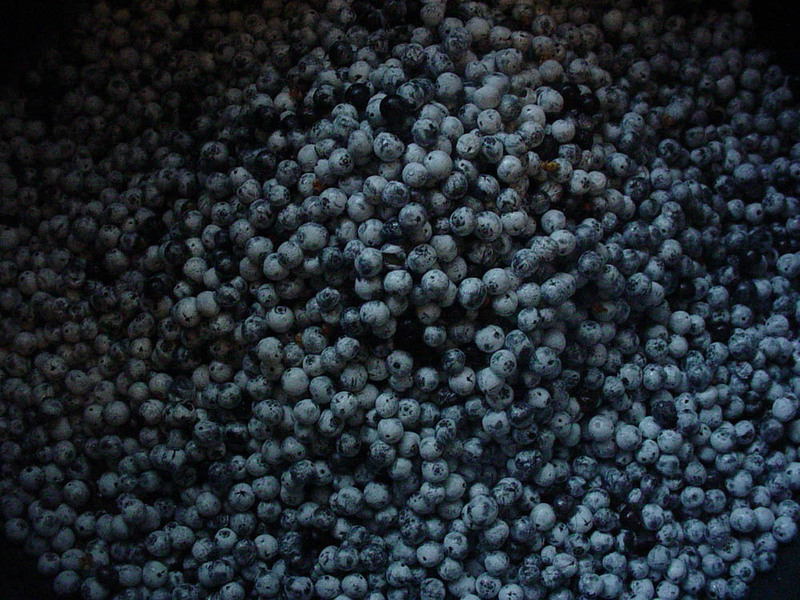 The berry skin is actually a very dark purple, but a waxy white ‘bloom’ makes them appear blue. Unripe berries are green or pale purple and should be left on the tree to ripen. Since unripe berries contain several chemicals which can make you sick (mildly toxic), be sure to pick only the ripe berries. Sometimes green berries will develop a waxy bloom, fooling you into thinking they are ripe (see below). You can check for ripeness by rubbing off the bloom and observing the color of the skin beneath. 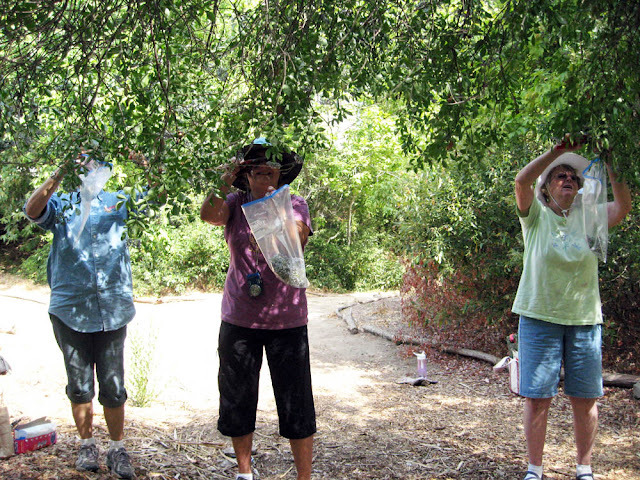 One good hint that the berries are unripe is if the birds aren’t eating them – they know a ripe berry when they see one! 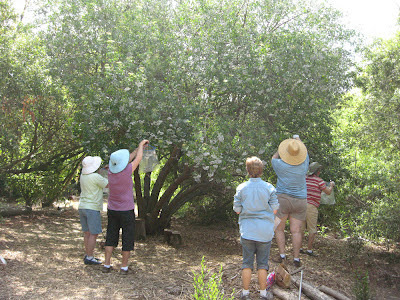 Elderberries are one of the easiest native berries to pick. They do stain, so you’ll want to wear old clothes for picking and processing them. And picking berries is always more fun if you’ve got company. So enlist a friend, family member – even a neighbor child – to join the picking party. We find it best to harvest an entire berry cluster just below the closest leaves (see below). 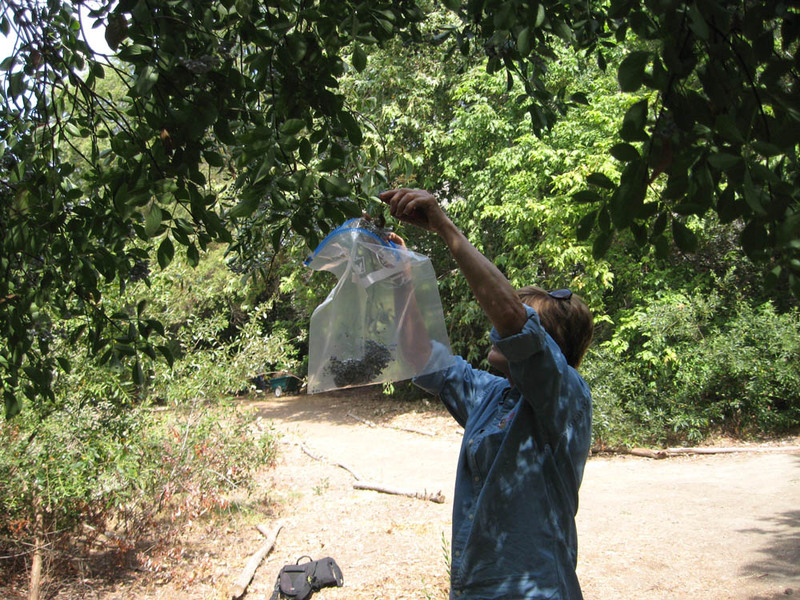 You can store the clusters in a plastic bag and do the final processing indoors – and at your leisure. 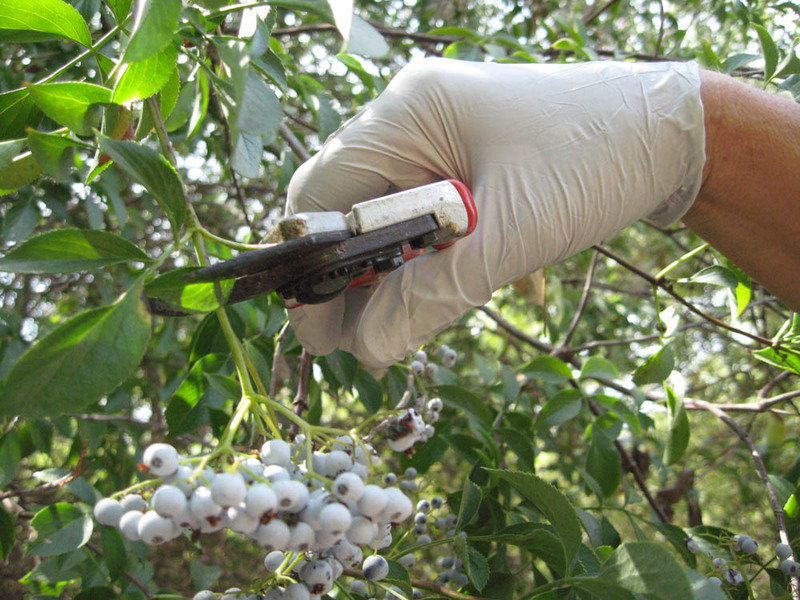 A light-weight garden pruner or sturdy kitchen scissors is adequate for harvesting low-growing clusters. As your tree grows, you may find it useful to invest in a long reach pruner. You won’t need the heavy duty models – one that costs $30-40 will do and give you years of service. Elderberries are relatively fragile (have a short shelf life). It’s best to refrigerate them as soon as possible and clean/process them within several days of picking. 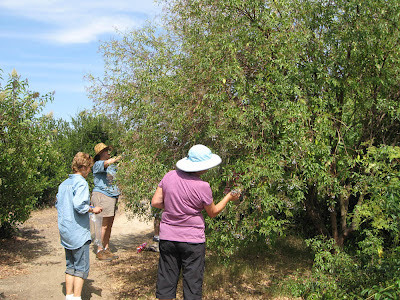 The first step is to remove the berries from the green stems. These stems are bitter, mildly toxic and should be discarded. An easy way to separate berries from the stems is to grasp the stem in one hand and gently rake off the berries with the fingers of the other hand. Some people use a large comb to dislodge the berries, but we’ve found that the ‘finger rake’ method gives better control. 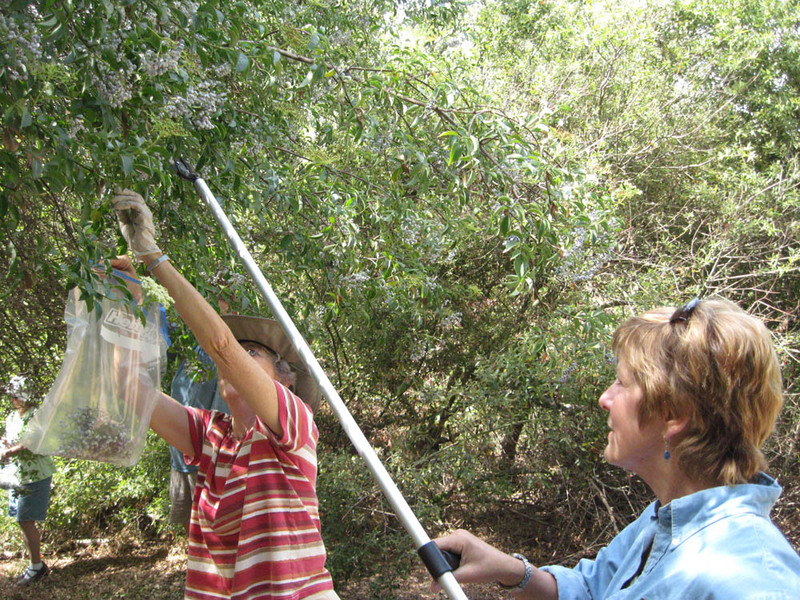 Be sure to also remove any old dried flowers, leaves and other debris that may have hitched a ride along with the berries. 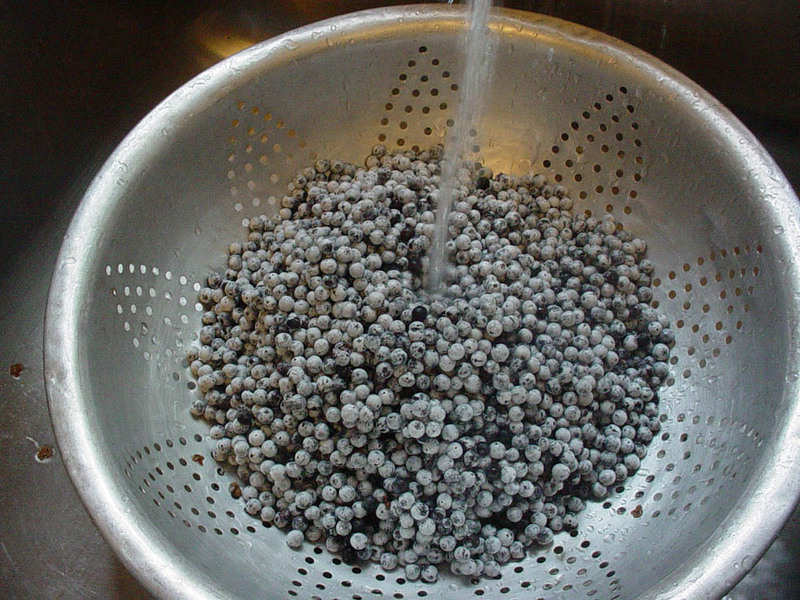 Before you know it you’ll have a bowl full of berries ready to wash. We find it easiest to use an old-fashioned colander or large strainer/sieve. If you put the colander in a bowl, you can wash the berries under running water and scoop off the floating debris (old flowers/dry berries) with ease. Once the berries are washed you can freeze them for later use, dry them (for use in tea or baked goods) or turn them into juice. Drying elderberries is quite simple. 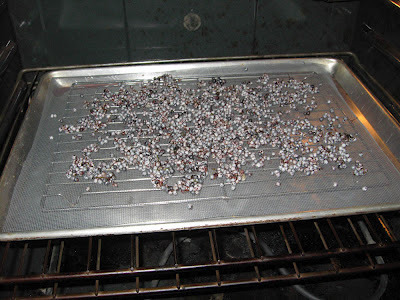 We’ve found that the easiest method is to spread them out on a piece of window screen to dry. You can purchase window screening from many hardware stores and cut it to the size you need. 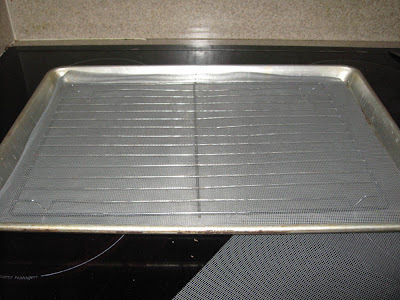 We lay the screen on a cooling rack, and place the rack inside a sheet pan or baking tray (see below). 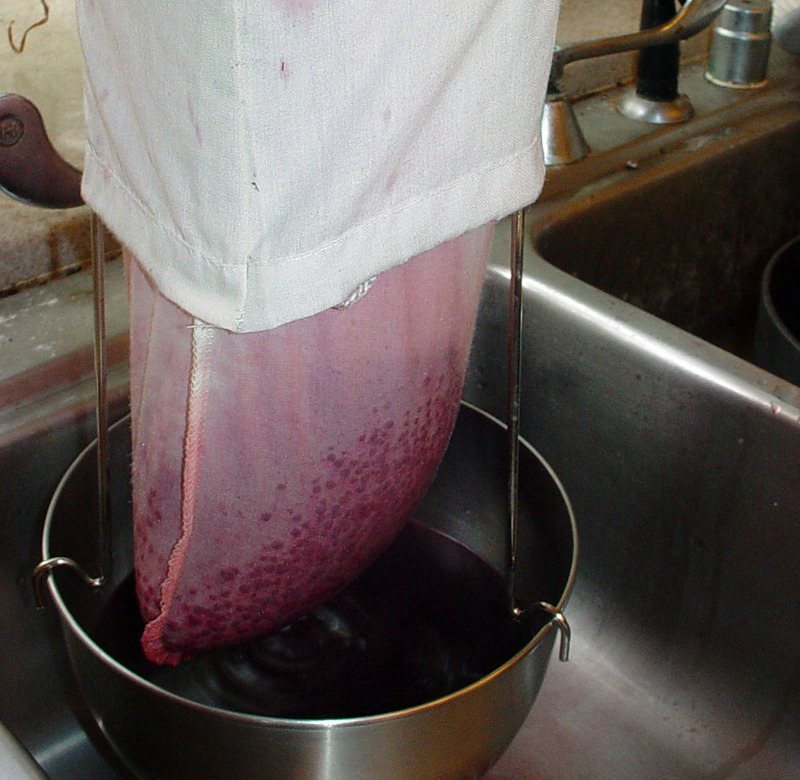 This allows for good air circulation around the berries and catches any juice that may drip during the drying process. You can air dry the berries if the weather is hot and dry. You’ll want to cover the pan with another piece of screen or cheesecloth if you dry them outdoors in the shade. 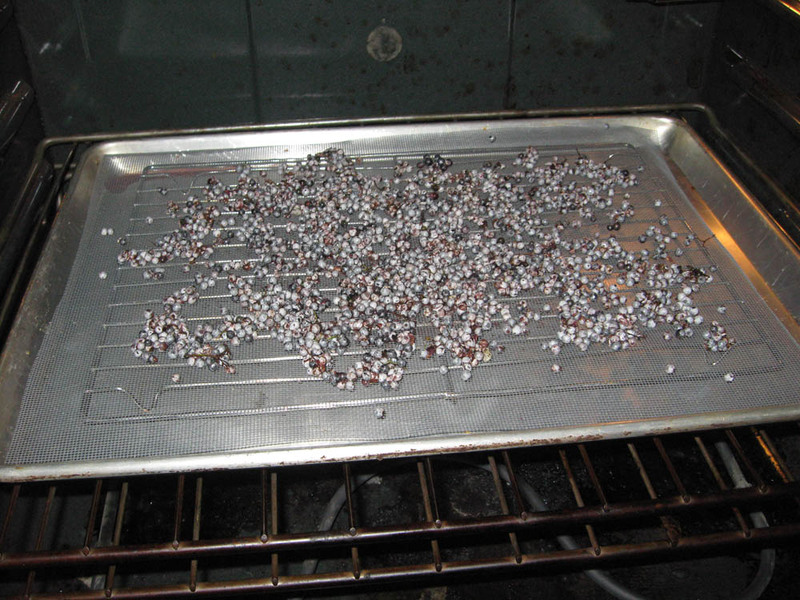 With a little care – and a good oven thermometer - you can dry your berries in the oven. Warm the oven (to less than 125 degrees – that’s important), turn the oven off and place the berry tray in the oven to dry. It will probably take several re-warming sessions to entirely dry the berries. 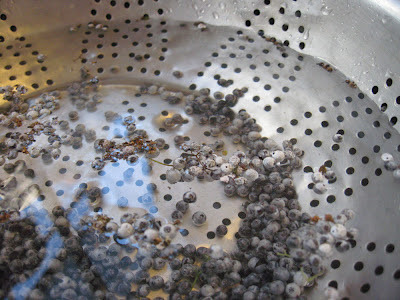 Even better, use a food dehydrator fitted with screens to keep the small berries from falling through. The dry berries are hard & shriveled – store them in a jar with a tight-fitting lid for later use. 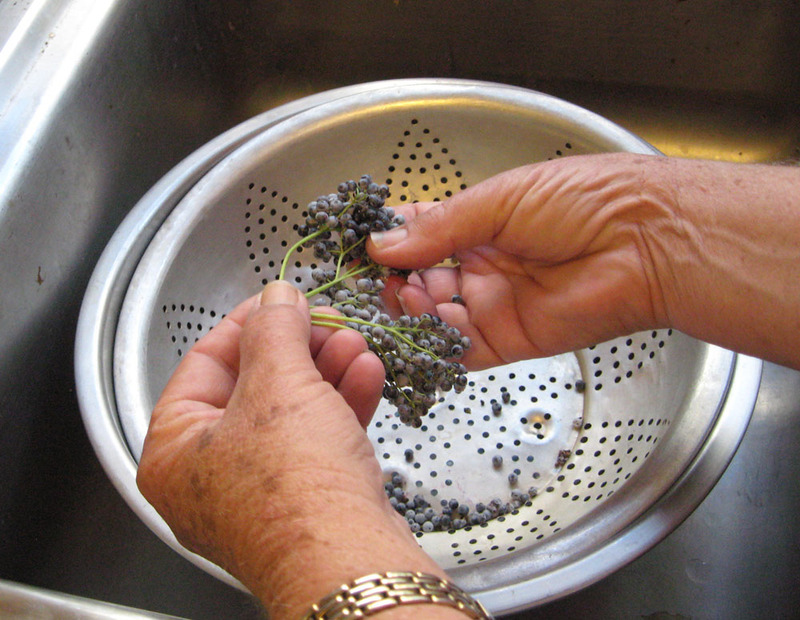 Making elderberry juice isn’t difficult, but some basic jelly-making equipment makes the job a whole lot easier. If you plan to make a lot of jelly, juice or syrup we heartily recommend purchasing a jelly strainer stand and bag. This handy tool costs less than $20.00 at hardware/kitchen stores (or on-line), takes minimal space when stored and makes berry juicing a snap. The stand fits over a pot or bowl (see below) and allows the juice to drain through the bag, leaving the pulp and seeds behind. The bags are usually a plastic mesh, but muslin (cloth) bags are sometimes still available. To make juice, place clean berries in a large, heavy saucepan. Crush the berries with a spoon or potato masher. 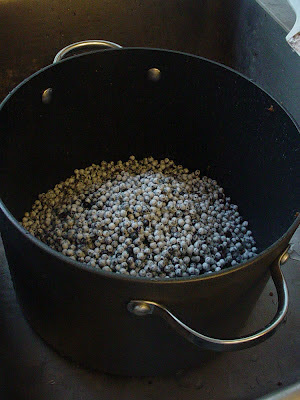 Fill the pan with water to just above the berries. Simmer the berries on medium heat for about 30 minutes or until juice is a dark color. Strain hot pulp mixture through a jelly strainer bag (or a large sieve lined with several layers of cheesecloth) to obtain prepared juice. 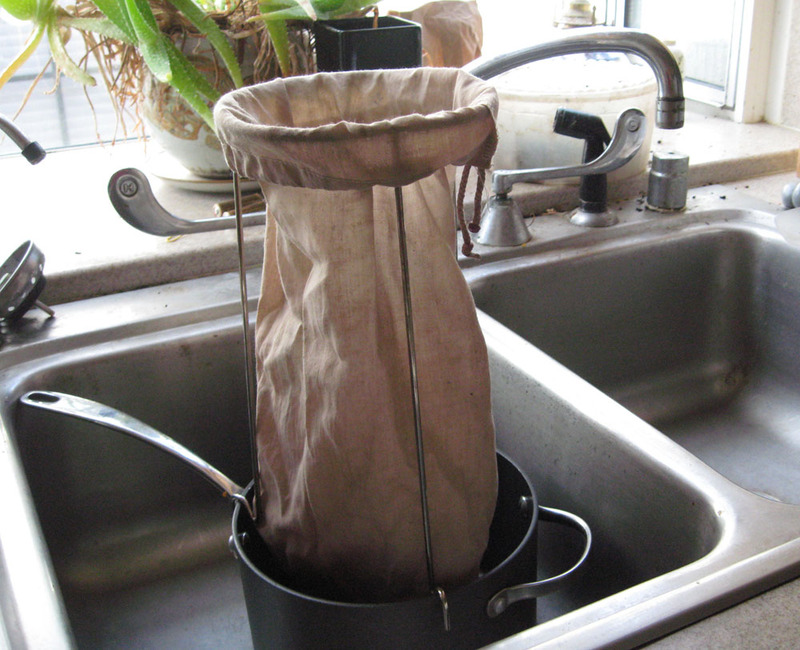 Let the juice filter through the strainer bag until the juice cools and the dripping stops. This month’s plant is currently so small that you probably missed it if you visited the garden (see above). But just wait – it soon will be one of our biggest plants! For many of us, summer is the season of the elderberry. Between bird visitors, fragrant flowers and ripe berries it’s hard to beat our native Blue Elderberry. And even though our plant is very young (about a year and a half), if you look closely you can see both flowers and berries this summer. The taxonomy of Blue Elderberry (sometimes also called Mexican Elderberry) has been the subject of some debate. While confusing to the home gardener, this debate results from a genuine interest in classifying the species correctly. As of 2012, the consensus opinion recognizes two variants of native North American ‘dark elderberries’: Sambucus nigra L. ssp. canadensis (American Black Elderberry) and Sambucus nigra L. ssp. cerulea (Raf.) R. Bolli (our western Blue Elderberry). The Elderberries are members of the Caprifoliaceae (Honeysuckle) Family. Blue Elderberry has previously been called Sambucus cerulea, Sambucus caerulea, Sambucus mexicana, Sambucus glauca, Sambucus neomexicana and several other scientific names. Some of the taxonomic confusion doubtless reflects its wide distribution in western North America, from southern Canada to northern Mexico. Widely distributed species are sometimes known by different names due to historical reasons. But there are regional differences in Blue Elderberry’s appearance. Some botanists and nursery people feel that ‘lumping’ them all together has obscured genuine biologic differences; so the taxonomy may change yet again in the future. For now, just remember that you may encounter Blue Elderberry under any of the above names. Where ever it occurs in the West, Blue Elderberry grows in moister areas within more dry surrounding habitats – or drier, more open areas in woodland habitats. Blue Elderberry grows where its roots can access deeper water. It’s not uncommon to find Blue Elderberry growing on river banks (a bit away from the water) or on slopes that get a little extra winter water. 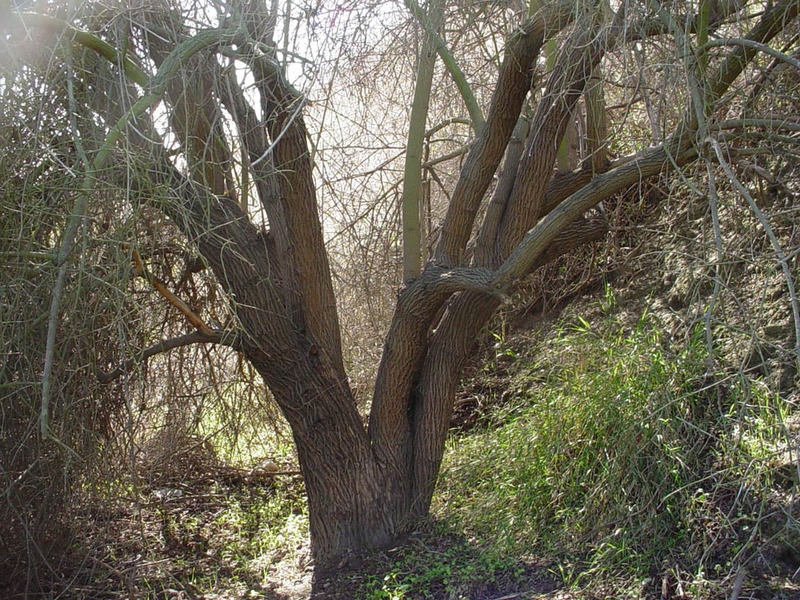 It traditionally grew near our larger seasonal streams and on upland banks along the L.A. River and its tributaries. There are still some nice native stands on the Palos Verdes Peninsula and in the western Santa Monica Mountains. 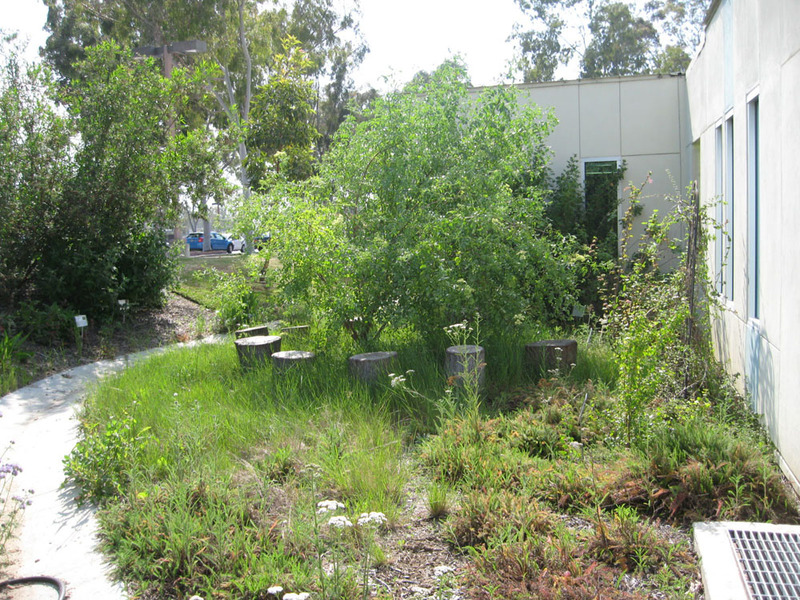 In fact, a tree from the northern side of the PV peninsula was the source for our garden’s specimen. In areas with cold winters, most of the new growth dies back each winter. The cycle of winter die-back and spring re-growth produces a large shrub 6-8 ft. tall and wide. 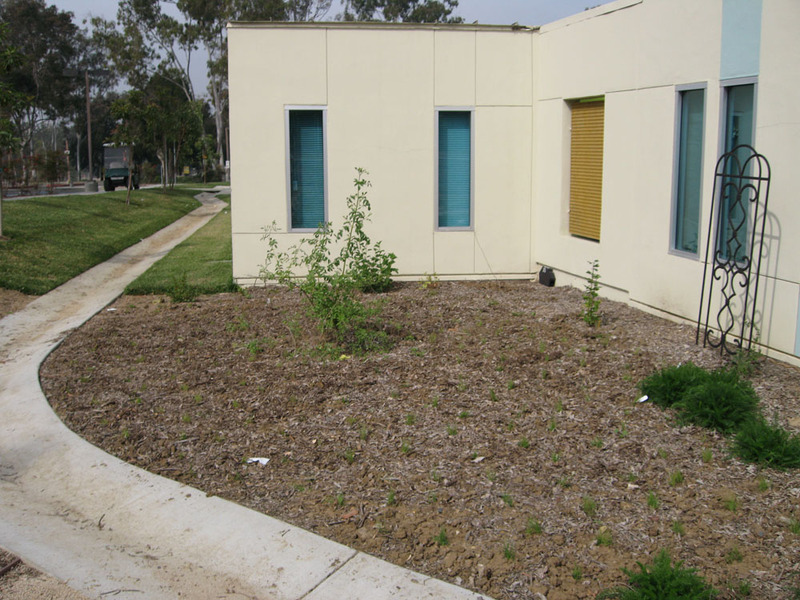 In areas with mild winters (like ours), Blue Elderberry can become much larger, ranging from a very large shrub (8-10 ft wide and 8-15 ft wide) to a small tree. With optimal water it becomes a nice sized tree up to 20-25 ft tall with a respectable trunk (see above – the source tree for the Elderberry in Mother Nature’s Backyard). Blue Elderberry is winter- and drought-deciduous, losing its leaves for several months of the year. In most home gardens, the leaf drop occurs in winter – usually sometime between early November and December in our area. Under drier conditions, plants may lose their leaves as early as late summer. Elderberries re-leaf quickly in winter or early spring – usually in late January or February in western L.A. County. Several features make Blue Elderberry an attractive plant. Even in winter, its furrowed, red-brown bark provides interest in the wilds or in a garden. The bark contrasts nicely with the pale green color of the leaves. The leaves are compound - made up of several leaflets – and somewhat succulent. Overall, the foliage has a lacy appearance although the shade under an Elderberry tree can be anything from dappled to quite dense depending on how the plant has been pruned. Elderberry has small, cream/yellow flowers growing in dense clusters, mostly at the ends of branches. Elderberries can begin flowering as early as May and may flower off and on throughout the summer. The flowers have a wonderful aroma – somewhat like spiced honey – that perfumes the air on warm summer days. This is just one of the benefits of using Blue elderberry as a shade tree. 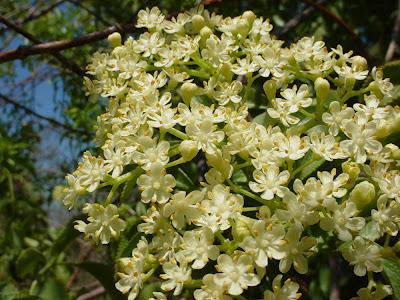 If you like the scent, you can use the flowers to make elderflower tea, syrup and even jelly. Just collect ripe flower clusters (your nose is your best cue), remove the green stems, wash with cool water, then cover with hot (almost boiling) water. After about 10 minutes you can strain out the flowers and drink the ‘tea’ or use it to make syrup or jelly. The berries for which Blue Elderberry is famous start out small, hard and green. In the warm summer months they grow, turning first a dark (almost black) purple, then soft and blue when fully ripe (hence the common name). 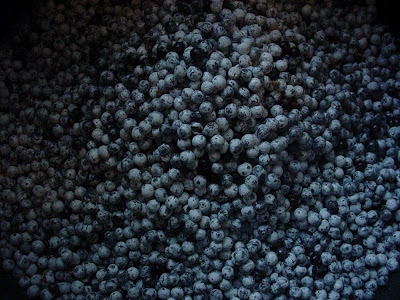 The blue color is due to a waxy ‘bloom’ that covers the berries. Most Elderberry trees/bushes have a ‘main ripening event’ sometime in summer (July or August) with additional clusters ripening before or after. In our next post (mid-August, 2012) we’ll discuss harvesting, cleaning and preparing Elderberries. Later in the month we’ll share some of our favorite Elderberry recipes. 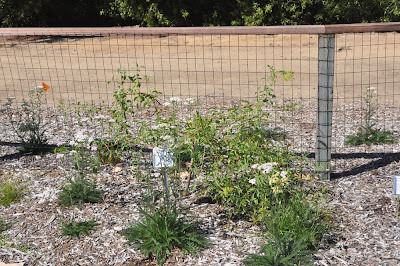 Blue Elderberry is a good habitat plant for the home garden. It’s large enough to provide perches, cover and nesting sites for birds. In summer and fall, a wide range of birds eat the fruits/seeds including finches, warblers, jays, orioles, bluebirds, grosbeaks and the Northern Mockingbird. Some migratory birds seem to prefer the dried berries over the fresh. Our most common pollinator seems to be the European Honey Bee. But you’ll also see some native bees, flower flies and other potential pollinators visiting the flowers. 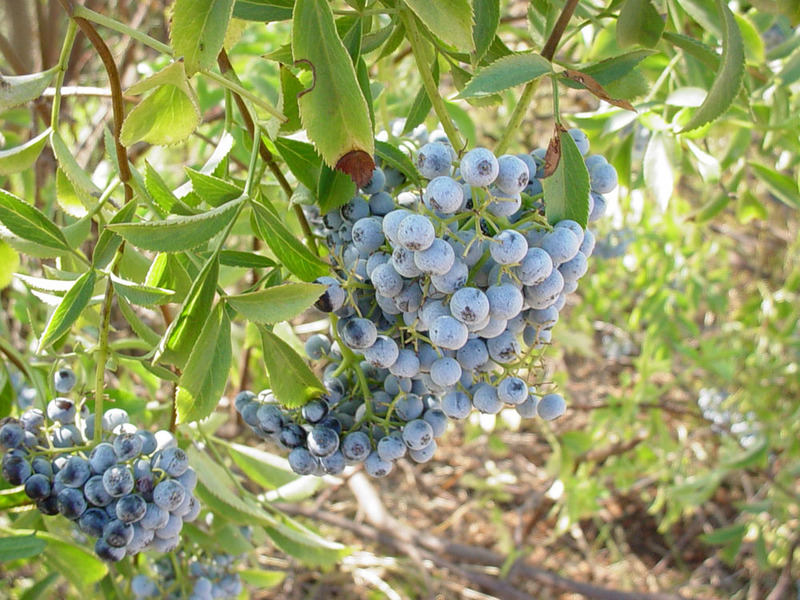 Blue Elderberry can be grown in soils ranging from quite sandy to fairly dense clays. 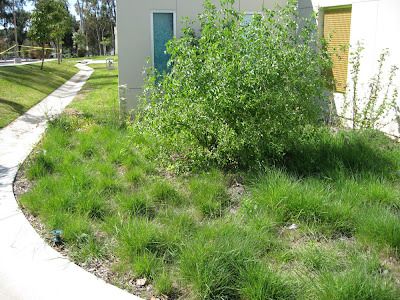 It doesn’t like salty soils or seaside conditions, but does well in gardens only a half-mile or so from the ocean. It likes sun, but can tolerate some shade. Established Elderberries are quite drought tolerant, but they produce best – and keep their leaves through the fall – if given an occasional deep watering in summer (Water Zone 2 - see our posting on Water Zone Gardening (April, 2012) for more on Water Zones). Blue Elderberry makes a nice addition to the home garden. 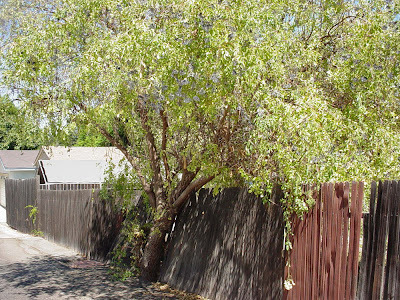 With a little yearly pruning, it can make a nice shade tree (see above). Elderberries are also valuable plants for slopes and stream banks. If you have a large property they make a lovely large shrub that requires little effort. Elderberries take a few years to become established. In our experience, the establishment period takes longer in sandy soils (3 to 4 years) than it does in clay soils (about 2 years). During the establishment phase, the plant spends most of its energy establishing roots; the above-ground growth is slower than many gardeners expect. Even more alarming, the early branches can be so spindly and low-growing that they appear almost groundcover-like. Never fear - patience is all that’s required. 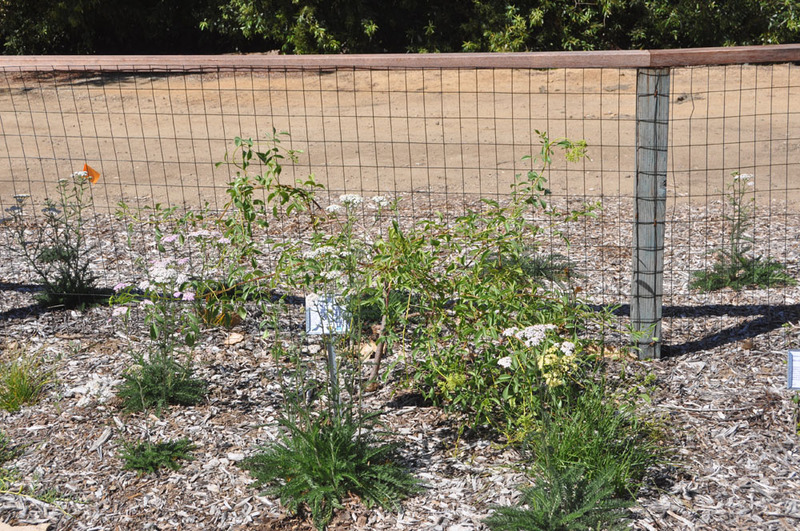 Once established, your Elderberry will grow quickly and can be selectively pruned to a more tree-like shape. To give you a sense of normal growth we’ve included a sequence of pictures of a young Elderberry growing on clay soil (below). 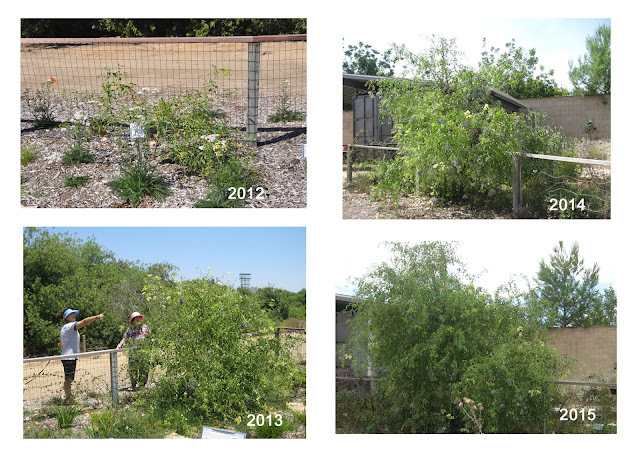 Elderberries grow rapidly after the Establishment Phase. If training your Elderberry into a tree, yearly pruning is essential during the first 5 to 6 years to establish a good form. New growth can be rampant – 1-2 feet or more per branch – in the spring. 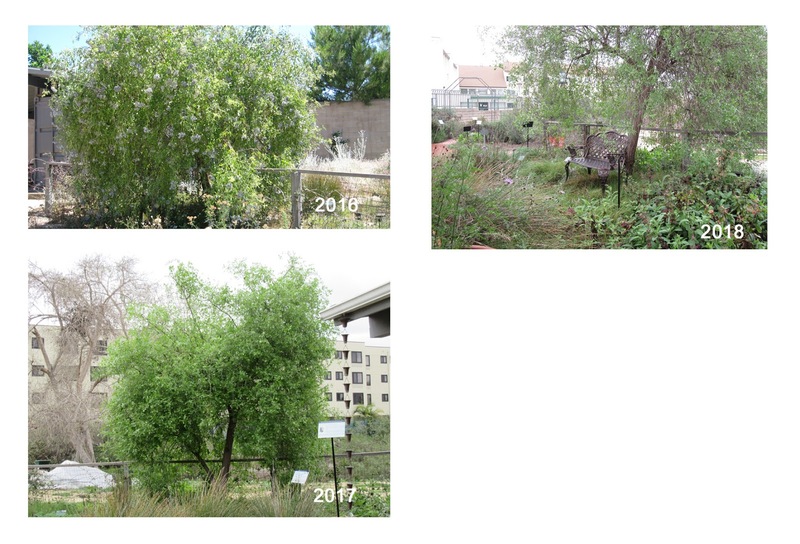 The new growth is relatively soft; the weight of developing berries causes the branches to droop in a ‘weeping’ pattern almost like a Weeping Willow. The trick to achieving a good tree form is to prune out downward- and outward-growing branches and prune back to upward-growing branches/buds. 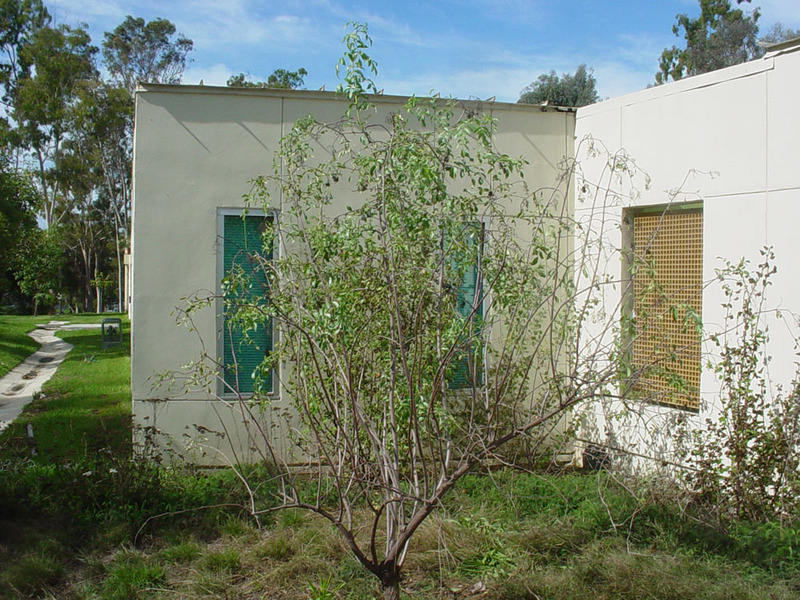 Pruning should be done in winter, when the plant is dormant. 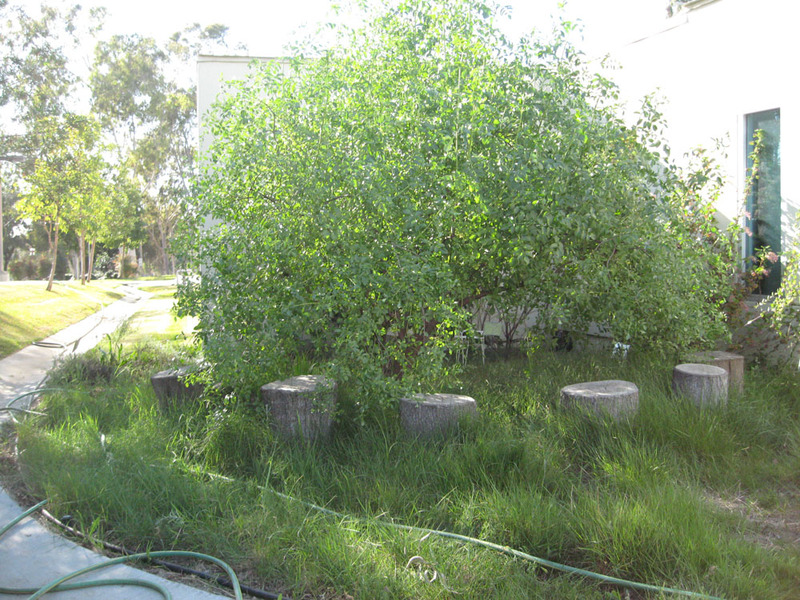 Never prune more than 1/3 of the total mass or you’ll risk harming the plant. Keep an eye out for suckering – remove suckers from trunk as they emerge in spring. After 5-6 years you’ll still need to prune out dead/diseased branches and branches that cross/rub – but you’ll need to prune for shape less. 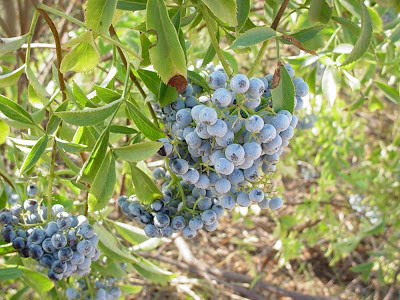 Blue elderberries are a favorite food among native peoples where ever they grow. 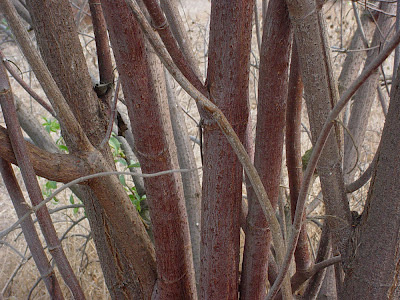 The Gabrieleno/Tongva (our local native California tribe) used the hollow stems of Elderberry to make flutes and clapper sticks (a type of percussion instrument used to beat the tempo during songs and dances). The straight stems were also used for arrow shafts, pegs and combs. 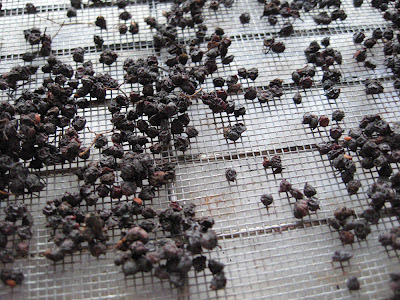 A dark gray dye was prepared from the berry stems to dye basketry materials. Blue Elderberry was also used extensively as a medicinal plant. 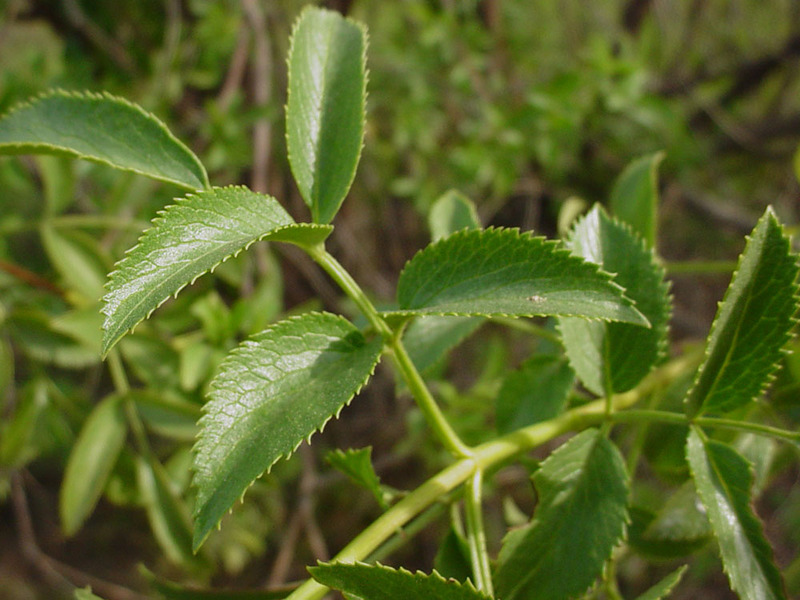 A wash prepared from flowers or leaves was used on skin sores, bruises and as a skin conditioner. Tea from the flowers is still used as a tonic and to fight colds. All parts of Blue Elderberry make plant chemicals that may cause nausea and diarrhea if eaten. Berries should be ripe – and should be cooked – to insure they are safe to eat. Elderflower tea is mild, but should be used in moderation. Be sure that the berries are Blue Elderberries – the berries of Red Elderberry – and the leaves of all elderberries - ARE TOXIC AND SHOULD NOT BE EATEN. Be sure to read our next post (mid-August, 2012) for tips on picking, cleaning and preparing elderberries. And here are some photos of the Blue elderberry in Mother Nature's Backyard from 2012-2018.